The best thing about micro wefts is that they so quick to install and remove, a full head of hair extensions can take around an hour or less. Imagine being able to transform your look in such a short about of time! No more long and boring trips to the salon, especially with our mobile services. They are also very comfortable to wear, as they lie very flat to the head creating a seamless blend with your own hair and the extensions. There are also very few bonds compared to other hair extension methods which means no sleepless nights due to tight extension bonds. Another of the great things about micro weft extensions is that they are far more gentle on your natural hair than many other extension methods. This is because there are less bonds on your natural hair. Compared to a full head of micro ring, shrinkie or fusion hair extensions there are less than 1/3 of the amount of bonds between your natural hair and extension hair when you have mirco weft extensions. Also micro weft extensions are very affordable. They are charged per row so they can be customised to suit your budget. As a rough guide, a full head of micro weft extensions (which would give you heaps and heaps of length and volume) would usually require around 5 rows of extensions. 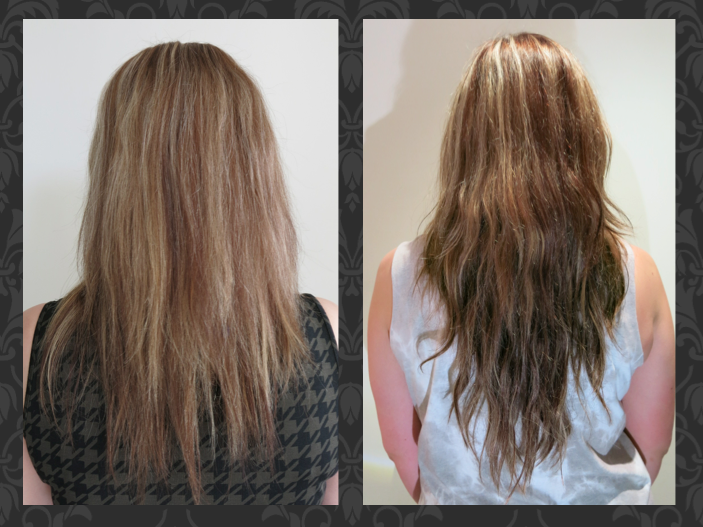 Most people get just 2 or 3 row of micro weft extensions and get great results.